(CNN) -- A global commodities trading company says it is considering a settlement to legal claims that it is responsible for the deaths of 15 people and thousands of illnesses after 500 tons of toxic waste were dumped in the African nation of Ivory Coast. 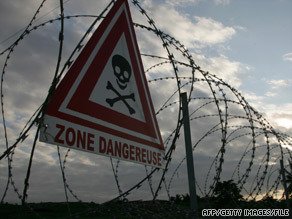 Signs such as this were still up in "toxic zones" around Abidjan, Ivory Coast, a year after the waste dumping. The Dutch company Trafigura said studies by 20 experts it has hired conclude that the chemicals did not harm anyone. "In view of that expert evidence, and the fact that claims are not being made in this litigation for deaths, miscarriages, still births, birth defects and other serious injuries, the parties are exploring the possibility of compromising the claims which have been made," Trafigura said in a release Wednesday. "A global settlement is being considered by the parties and it currently appears that this settlement is likely to be acceptable to most, if not all, of the claimants." A United Nations report also released Wednesday said Trafigura did cause death and injury when the cargo ship Probo Koala dumped 500 tons of toxic waste belonging to the company at sites around Abidjan, the West African nation's largest city. The incident happened in August 2006. "According to official estimates, 15 people died, 69 people were hospitalized and over 100,000 others, complaining of nausea and vomiting after inhaling fumes, sought medical treatment after the incident," said the report by Okechukwu Ibeanu, an unpaid investigator for the Geneva-based U.N. Human Rights Council. "We still don't know -- and we may never know -- the full effect of the dumping. But there seems to be strong prima facie evidence that the reported deaths and adverse health consequences are related to the dumping of the waste." Ibeanu, who visited Ivory Coast and the Netherlands during his investigation, urged all parties to take steps "to address possible long-term human health and environmental effects of the incident." According to a U.N. statement, Ibeanu said last month that the areas where the toxic waste was dumped still have not been decontaminated and continue to threaten residents' health. Many people, he said, are still reporting headaches, skin lesions, digestive difficulties and nose, throat and lung problems. Trafigura noted in its release Wednesday that it initiated a plan two years ago that would compensate, without any admission of liability, any claimants who could demonstrate any injury caused by exposure to the waste, which the company calls "slops." "The company has always maintained that the Probo Koala's slops could not possibly have caused deaths and serious or long-term injuries," Trafigura said. "Independent expert witnesses firmly support Trafigura in this stance." Trafigura also maintains it "sought to comply with all relevant regulations and procedures concerning the offloading of the Probo Koala's slops in Abidjan." The company denies that the ship went to Ivory Coast solely to dump the toxic waste. "Trafigura has consistently stated that the Probo Koala was returning from a routine commercial voyage to deliver a gasoline cargo in Lagos, Nigeria, when it stopped in Abidjan," the company statement said. "Consequently, any suggestion that the vessel was sent to West Africa solely for the purpose of offloading its slops is entirely inaccurate." As one of the largest independent companies trading commodities, Trafigura has 1,900 employees in 42 nations, the company's Web site says. "We handle every element involved in the sourcing and trading of crude oil, petroleum products, renewable energies, metals, metal ores and concentrates for industrial consumers." the company says. Ivory Coast, a former French colony with a population of 20 million, is also known as Cote d'Ivoire.